I haven’t made a sweet bread in months, and this morning I just felt like enjoying some apple cinnamon bread for breakfast, and of course I knew that my boys would love the idea. We adore the apple cinnamon combination any time of year, and this bread makes a nice breakfast and brunch item. You can make it the night before and slice it to enjoy with coffee and fruit in the morning. If you want to make it in the morning, start early because it takes about an hour to bake, although mixing takes only a few minutes. The aroma of the cinnamon is so nice and comforting, no matter what time of year it is. 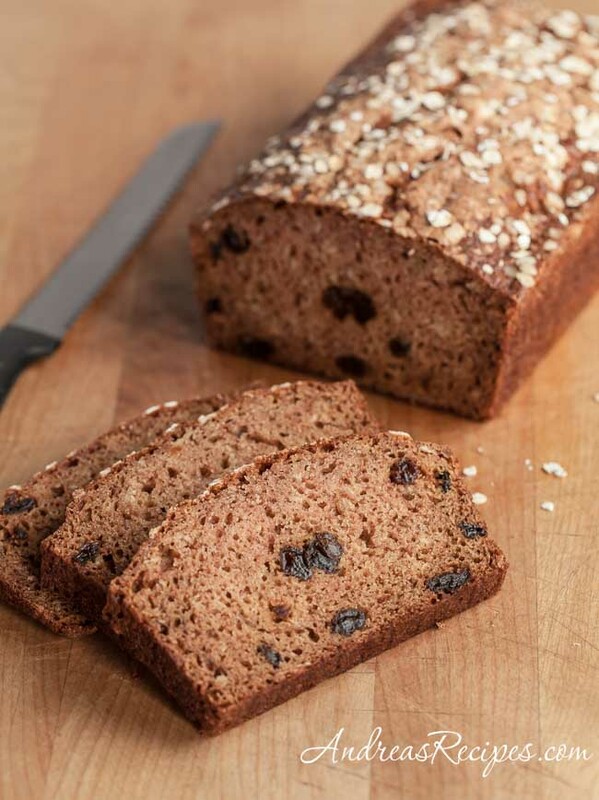 I like to make this bread with a mix of unbleached all-purpose and whole wheat flour and plenty of cinnamon and raisins, though I can also imagine currants or chopped prunes in the bread as well. 1. Place the oven rack in the middle and preheat the oven to 350° F/175° C.
2. In bowl of the stand mixer, cream together the butter and sugar until light and fluffy. Mix in the applesauce, cinnamon, and quick oats. Mix in the eggs one at a time, beating well each time, then mix in the grated apple. 3. In the medium mixing bowl, whisk together the unbleached all-purpose flour, whole wheat flour, and baking soda. Take the mixing bowl off the stand and fold in the flour mixture just until the dry ingredients are incorporated. Add the raisins, folding gently. Pour batter into the prepared pan and sprinkle some cinnamon sugar and more quick oats on top. 4. Bake in the preheated oven until a toothpick inserted into center of the loaf comes out clean, about 50 to 60 minutes. Allow to cool in the pan about 10 minutes, then cool on a wire rack before serving. Keep leftovers wrapped in plastic wrap for up to 3 days. i love low-fat recipes. but i am never a big fan of apple sauce. you think i can substitute it with non-ft yogurt instead?? Hi Jacqueline! Yes, you can substitute non-fat yogurt. This looks delicious! I’m with you – apples, cinnamon, (all the fall-type recipes) are great all year round in my house, too!! I can’t wait to try out this recipe, however I see one small error. You list apples as one of the ingredients, but you don’t say at what point in the preparation steps the cut apples are added. Should we assume Step 5, along with the raisins? Sure Tara, you can use regular salted butter and only all-purpose flour. The recipe will work fine. Glad you like it!